During the closing weekend of the London Jazz Festival last year, the most avant garde in nature of the LJF in recent years the final Saturday programme provided a unique snapshot of how substantial and wide ranging the avant garde is stylistically within the music across the decades. For instance, on just one day there was Henry Threadgill and his band Zooid covering the A-Z of the Chicago and New York jazz avant garde supported by US-based Doncaster area pianist John Escreet, while earlier Gannets featuring moonlighting Guillemot Fyfe Dangerfield, not singing but playing piano and synths, delved deep into improv rather than strictly free jazz along with drummer Steve Noble, bass clarinet virtuoso Chris Cundy, clarinettist Alex Ward and double bassist Dominic Lash. By contrast and it was still very much avant garde but this time from the new generation of French improvisers over at the Vortex in Dalston the Coax Collectif triple bill had Pipeline, Irène and Metalophone on stage. Two nights ago Irène returned to the club in a double bill, this time with English electronicists Ma who opened proceedings. Irène has been billed as the French version of Polar Bear and I can see why people have written this down although it’s a bit of a back-of-a tatty-envelope description, tempting though it is. The band is (and I still haven’t found out who the titular ‘Irène’ is, although it’s safe to say she wasn’t on stage) Yoann Durant and Clement Edouard on saxophones and electronics, plus the interesting sounding bluesy texturalist Julien Desprez on guitar and Sebastien Brun at the drums. Coax is a bit like the Loop collective in practice and artistic impulse, and it’s fair to say they’re where it’s at in terms of the new young French scene. They aren’t that known yet beyond la belle France and the Vortex show was alas sparsely attended, although word had seeped out among musicians and the likes of José James’ drum hotshot Richard Spaven came in for a listen, and the band complemented Ma nicely. In Ma’s mature set Tom Challenger played beautifully at the helm of a three-piece that deserves to be better known although his other band Dice Factory may well get talked up a bit more but they’re both inspiring. 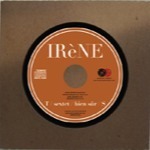 Irène have released a four-track EP (pictured) and plan to release an album this year co-operating with the British Babel label for added exposure. The band has won awards at the prestigious La Défense Jazz Festival in France but like many young bands in France and in the UK it’s hard to make the next step forward even with kudos such as this. There is definitely an audience out there. The music is not massively difficult. It can be loud, it has some spiky touches and it’s abstract harmonically for sure but it is different, and pointless comparisons would not be helpful. Perhaps some of the material needs tightening, and I’m not sure about playing a soprano saxophone upside down, but hey vive la différence and go hear them if you get a chance.